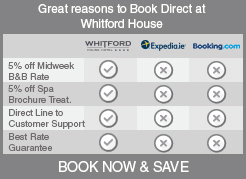 The Whitford House Hotel is a luxurious peaceful hotel that makes for an incredible getaway. At Whitford we strive to encourage you to have an amazing escape, our dynamic team are dedicated to excellence in customer service; in recognition of this we were awarded Wexford’s Overall Hotel of the year in 2016. Our Deluxe King is a beautiful guest room that is perfect for a relaxing break. This room has a calming ambience, with added comforts such as air-conditioning and a delightful balcony where a glass of wine is the perfect way to unwind after a busy day. This room can be arranged as either one king double bed or two single beds. To compliment your room you will have access to our Leisure Club which includes our; Spata Gold Medal Award winning 20m deck level pool, tranquil hydrotherapy, relaxing Jacuzzi, and a full gym. Explore the paradise that Wexford, Ireland has to offer. Book today!